Don’s Classic Stamps sells better quality rare and old postage stamps, both mint and used, to stamp collectors around the world. Our ever increasing selection will always give you a variety of items to choose from. Therefore, whether you are new to the hobby or you are an advanced collector, we have a stamp for you in our store. Enjoy your visit. 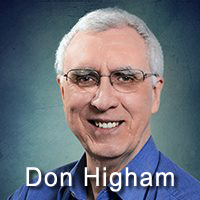 Don Higham is the owner of Don’s Classic Stamps. Don is a retired Family and Divorce lawyer who, during his 39 years of practice in Surrey, British Columbia, Canada, actively collected stamps. His many stamps will be continually added to this online store. Therefore, visit often so you won’t miss out on buying some of the unique stamps yet to be listed. Shop with the comfort of knowing each and every stamp offered for sale by Don’s Classic Stamps comes with Don’s personal guarantee. If, for any reason, you are not 100% satisfied with your purchase, return the stamp(s) within 30 days of purchase for a complete no-questions-asked refund of your money. It’s that simple.